a core from the subglacial lake. Tim Hodson, a Ph.D. candidate in geology, recently scored what has to be one of the coolest internships of the summer. In August, Hodson will spend three weeks mapping never-before-seen depths of the Atlantic Ocean while aboard the Okeanos Explorer, a former U.S. Navy ship converted into an exploration vessel. Operated by the National Oceanic and Atmospheric Administration, the ship stretches more than half the length of a football field from stem to stern. Okeanos Explorer boasts a deep-water multi-beam sonar mapping system that can survey wide swaths of the seafloor through water depths of more than four miles. It also is loaded with other high-tech instrumentation, including underwater cameras and a remotely operated vehicle (ROV) known as Deep Discoverer (D2), employed to further investigate interesting seafloor features. Telepresence technology, which uses real-time broadband satellite communications, connects the ship and its discoveries live with audiences ashore. Internships aboard the Okeanos Explorer are highly sought after, and Hodson was selected as “one of the few from a candidate pool that was unprecedented in both its size and in the high quality of applicants,” according to the NOAA Office of Ocean Exploration and Research. Hodson couldn’t be more excited about the upcoming adventure. “For a flatlander like me, it’s thrilling,” says Hodson, a native of Champaign, Ill. “It’s exciting to think we’ll be exploring this hidden environment of octopi, crabs and other strange creatures that live in the ocean depths. But Hodson has managed quite well for himself in the category of real-world experience, often working alongside his adviser, NIU Board of Trustees Professor Ross Powell. Hodson has conducted mapping work in Washington’s Puget Sound and in Alaska’s Glacier Bay National Park and Preserve. 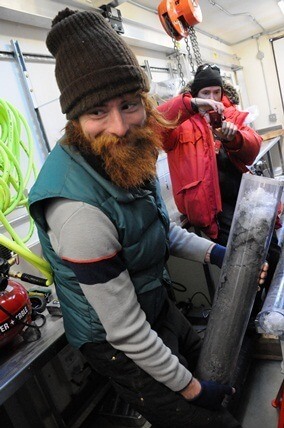 Last year, he helped test a new NIU robotic submarine in Lake Tahoe and traveled to the Antarctic with a research team that collected the first intact samples from an Antarctic subglacial lake. Tim Hodson in the Antarctic. 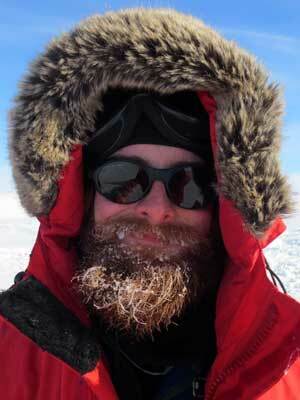 Hodson will be returning to the icy continent late this year for a research expedition led by Powell. Since the Okeanos Explorer was commissioned in 2008, it has traveled the globe, exploring the Indonesian “Coral Triangle Region;” benthic environments in the Galápagos; the geology, marine life and hydrothermal systems of the Mid-Cayman Rise within the Caribbean Sea; and deep-sea habitats and marine life in the northern Gulf of Mexico. Hodson will depart from the Rhode Island coast and help map North Atlantic seafloor mounds, which are thought to be extinct volcanoes that still generate thermal activity. “Beyond the thrill of exploration, there’s a clear benefit to humanity from seafloor mapping,” Hodson says. “Throughout history, humans have depended upon the bounty of the sea. However, we’ve become so proficient at exploiting the ocean that the effects are devastating many of our natural fisheries.